Ethel M still makes their legendary chocolate pecan brittle in small batches. This collection combines the very best of Ethel M Chocolate. First, start with twenty-four pieces of their world-famous pecan brittle. More buttery and softer than most brittle you'll find. 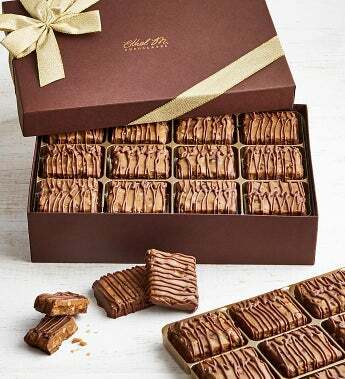 Then, they've drizzled premium gourmet chocolate over the top of each piece to make each bite even more perfect than before. The end result is one of the best tasting chocolate delights ever. This decadent chocolate gift is a favorite of the Simply Chocolate tasting panel. Ethel M Chocolates was started in 1981 by Forrest Mars to honor his mother, Ethel Mars, the matriarch of the famous Mars chocolate family. Using her timeless recipes which date to 1910, Forrest created fresh-crafted, small-batch premium chocolates. Ethel M’s gourmet fillings and decadent chocolates are made with fresh ingredients and no preservatives. Dedicated to the artisan style small-batch tradition, the chocolatiers at Ethel M still grind their own nuts, mix their own flavors, and cook their caramel fillings in the original copper kettles. All boxes are hand packed with the utmost care into signature Ethel M gift boxes and finished with a shimmery gold ribbon.